Attending med school in New York is something that is prized by many medical school applicants because of the location. Moreover, all New York medical school students incur similar costs for attending even if they are out-of-state students. According to U.S. News and World Report, New York University (Langone), Columbia University, Icahn School of Medicine at Mount Sinai, Weill Cornell University, University of Rochester, and Albert Einstein College of Medicine are ranked among the top 50 medical schools in the country. Additionally, New York offers a variety of experiences for all students – from living in one of the five boroughs to experiencing life upstate. 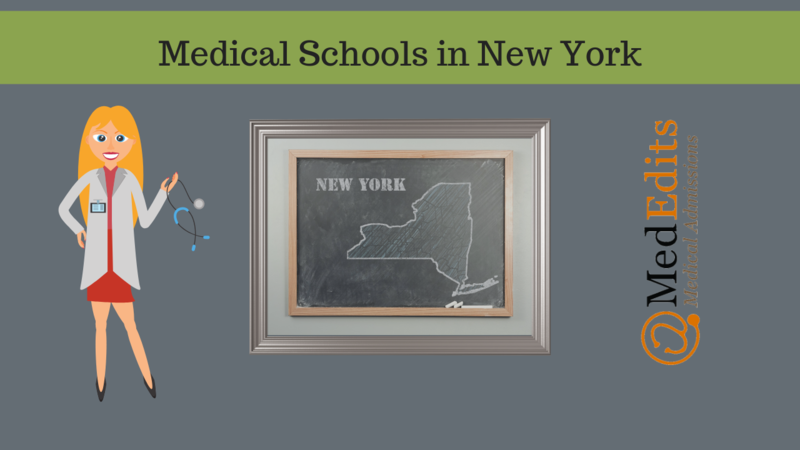 Furthermore, medical schools in New York vary in their level of competitiveness. Overall, there are many options for students to explore, making New York medical schools a great option for applicants. Want to be competitive for New York medical schools? Schedule a free 15 minute consultation with MedEdits. How Competitive are you for Medical School Admissions in New York? To determine your competitiveness for a New York medical school, you must review the average MCATs and GPAs for accepted students as well as the medical school acceptance rates. So, how difficult is it to get accepted to a New York medical school? Let’s review the data. Below are the average MCAT scores and GPAs, the interview rates for in-state and out-of-state applicants, acceptance rates, percent of entering class that is in-state, and tuition for all medical schools in New York. So, what can you do to increase your chances of getting accepted to a New York medical school? Be realistic about your competitiveness and do what you need to improve your chances. When deciding when to apply to medical school, you should consider how your average GPA and MCAT compares to the school’s average GPA and MCAT for accepted students. If your GPA and/or MCAT are lower than the New York medical schools you would like to attend, consider boosting your GPA or MCAT to make yourself more competitive. Although most New York medical schools do offer applicants the opportunity to complete the secondary application, it is imperative to keep in mind that completing the applications is a huge investment of time and money. Moreover, it means that receiving a secondary application does not necessarily mean that you are moving ahead in the application process – it may just be an additional application to your initial one. It is absolutely essential for you to research the schools thoroughly and determine whether the school is truly a good fit for you. In addition to your GPA and MCAT (two very important factors), your personal statement supplements your resume with an additional narrative. Therefore, it is absolutely crucial for you to write and edit multiple versions, and submit the one that BEST describes your who you are and your passion for medicine. Medical schools have made it clear that they are looking for well-rounded applicants. They are looking past the paper applications. In addition to your GPA, MCAT scores, research, and clinical experience, they want to see your passion for helping your community. This is not reserved to simply volunteering experiences, but could be demonstrated in a variety of ways – such as starting a new club at your college or teaching students in underprivileged areas. All the activities you partake in, do not have to be related to medicine. They could be activities that you are passionate about that demonstrate your commitment to other interests. Also, during your interviews, the committee is not looking for textbook answers. They want to know that you can think on your feet, that you are sincere and authentic. Overall, the entire process of applying to medical school can seem stressful and time consuming. So, it is crucial for you to determine which medical schools you want to apply to. Researching and if possible, requesting a campus tour, can really shed light on whether the medical school will be a good fit for you, however, this is not always possible or realistic. If you find that you are a competitive applicant for a New York medical school, it is imperative that you determine whether the school aligns with your own ideals, interests, and goals. For example, some schools are more focused on research, whereas others focus on patient care. You will have the greatest sense of a medical school’s values and strengths during your interview day.